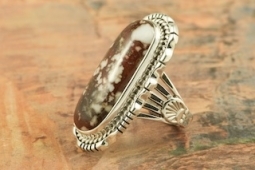 Beautiful Sterling Silver Ring featuring a Genuine Wild Horse Stone. This stone is also known as Crazy Horse Stone or Appaloosa Stone. It�s a mixture of magnesite and hematite (an iron mineral) and is found in Gila Wilderness Area in Southern Arizona. It got its name because it resembles a spotted brown and white pinto horse. 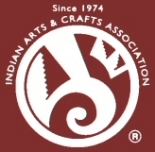 Created by Navajo Artist Walter Vanderver. Signed by the artist.